Written in chronological order, and broadly based on the author's personal diary, starting from his first day in office, this volume brings together economics, banking, regulation, governance, history, politics and international relations. Presenting personal witness statements, including records of noteworthy telephone conversations, informal meetings and other milestones, it examines crucial questions like: How did Cyprus become so systemically important to the rest of the euro area? Why was Cyprus treated so differently in comparison to other peripheral countries in Europe? Why were bank depositors targeted? What role did Cyprus' links with Russia play in the design of the programme? What has been the toxic fallout from the bail-in? Are there any longer-term implications for the euro? What are the lessons for regulators around the world? The book will appeal to readers interested in financial crises, the euro's architecture, the evolution of the European Monetary Union, and those with an interest in how Europe and the IMF dealt with crises in peripheral European countries. Panicos Demetriades served as Governor of the Central Bank of Cyprus and was a member of the Governing Council of the European Central Bank from May 2012 until stepping down from the governorship in Cyprus in April 2014, a move that The Economist described as `a blow to central bank independence'. He returned to his academic position in the UK as Professor of Financial Economics at the University of Leicester shortly after. 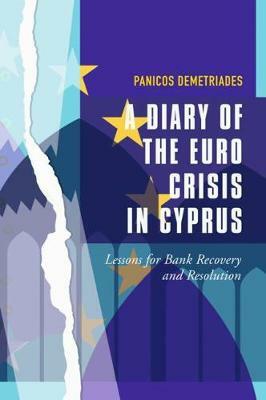 Professor Demetriades continues to speak regularly around the world on his experience as Governor of the Central Bank of Cyprus during one of Europe's worst financial crises. He holds a PhD in Economics from the University of Cambridge, UK, and BA and MA degrees, also in Economics, from the University of Essex, UK. His academic career spans a period of 25 years, the last 15 of which have been with the University of Leicester. He has published extensively in academic journals and books, primarily in the area of financial development. According to RePec (Research Papers in Economics) he is among the most widely read economics authors in the world. He has also published in `popular' and specialist media, such as VOX-EU and The Financial Times. He is frequently a guest on TV and radio programmes worldwide in relation to the euro crisis, Brexit and other economic issues. Professor Demetriades is a Fellow of the Academy of Social Sciences of the United Kingdom. Good book - I found the book very worthwhile and interesting. The pleasant thing here is that he writes clearly and well about complex subject. A great read about a stressful time - to get an insight of financial crisis – this is a must read!! This is an incredibly interesting and informative tale. I really liked this book; this book is user friendly, well written and well thought out. As a financial economist, I have read numerous books on the recent financial crisis. To my surprise this book was not only interesting, but actually the best book I have read on the financial disaster. This book is very complete and comprehensive. I've recommended it to others and don't hesitate in doing the same here. The insight is originating from the author’s background; The author seem to be incredibly talented at making things simple and easy to understand, carefully and convincingly explains what was happening behind the scenes, and what these events really meant. This should definitely be mandatory reading for people looking gain more knowledge about financial crisis in real world. Great for your inner intrinsic economist! !